The Super Bowl is tomorrow, and Apple’s iBeacon will be there. The New York Times reported this week that iPhone owners in East Rutherford, New Jersey (where MetLife Stadium where the Super Bowl is) — and also in some areas of New York City — will be part of an iBeacon-based advertising gimmick. The NFL Mobile app has been iBeacon enabled, and users will get pop up messages with advertising, offers to buy merchandise and information about NFL exhibits. Here’s the best part. When iBeacon detects that you’re in a long line at the game, you’ll get an alert telling you where in the stadium you can buy the same junk food but with shorter lines. 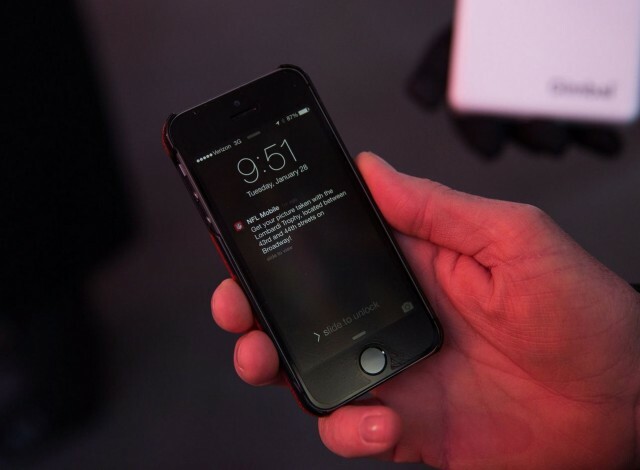 The use of iBeacon creates a high-visibility showcase for Apple’s new indoor location technology. But the Super Bowl is just one of many splashy applications. Major League Baseball is also embracing iBeacon. The league’s At the Ballpark app is being iBeacon enabled, enabling anyone at any MLB stadium to get information based on where they are in the stadium. As you walk up to the entrance, your ticket’s barcode automatically pops up on the screen for quick scanning. The app also has a seat locator. An app loyalty card has a “virtual hole punch” for racking up points leading to a free hot dog. Sugared water seller Coca-Cola is looking seriously at iBeacon for sponsorship tie-ins at some of the most major events, including the World Cup in Brazil this summer. They’re still vague about what they’ll use it for, exactly. Basically, it appears that major sporting events are being iBeacon enabled. That’s interesting because promotional gimmicks are usually over-hypped and clearly communicated to fans, so people are going to know about this. iBeacon is also showing up in other places, both unexpected and expected. A device called the Automatic smart driving assistant costs $100, plugs into a car’s data port and interact with apps on both iPhones and Android phones. Once you plug it into a car’s data port, you can use the smartphone app to monitor car performance through Bluetooth. It also remembers where you parked the car and performs other small jobs. The product was recently upgrated with iBeacon. Not only is the car itself a mobile iBeacon, which can interact with point-of-sale systems and other location-based applications, but the data port connection allows it to report information to mechanics instantly and wirelessly. The Rubens House museum in Antwerp, Belgium, has been iBeacon enabled. The museum place a huge number of iBeacons all over the place, giving visitors x-ray scans of the art work, and other information about the artwork they’re standing directly in front of. Shopkick is launching a 100-Store iBeacon trial for American Eagle. This is pretty much the kind of application most people think of when they learn about iBeacon. Shoppers get a welcome message when they enter the store. Once inside they’ll get deals, rewards, discounts and recommendations based on where they are in the store. Assume these and other trials go well, Shopkick may roll out iBeacon support to many of the other stores it already has as partners — some of the biggest retail outlets in the country. The bottom line is that 2014 is going to introduce the United States to iBeacon. It will be almost inescapable for some people. Today, most people have never heard of iBeacon. And even those paying attention and who have heard about it don’t quite understand it. By the end of the year, I think iBeacon will be essentially a mainstream and expected set of capabilities for any kind of event or location-based situation where people are using “official” apps. Ultimately, I think instant bar-codes, hot dog finders and in-store coupons are a trivialization of a very powerful capability that will really find its stride in wearable computing, home automation, industrial applications and real-world gaming. Still, the growing ubiquity if iBeacon technology at sporting events, retail stores and inside cars is a great first step.